Published in 2002, Cradle to Cradle is widely acknowledged as one of the most important environmental manifestos of our time. 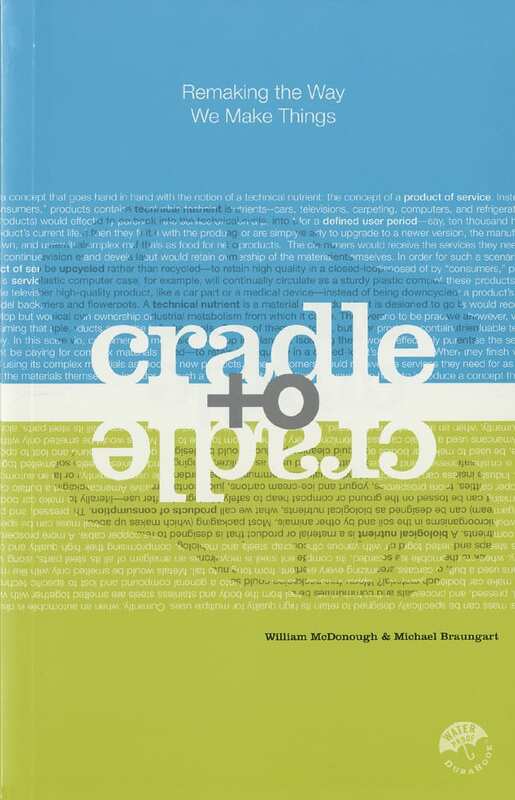 In Cradle to Cradle: Remaking the Way We Make Things, architect William McDonough and chemist Michael Braungart present an integration of design and science that provides enduring benefits for society from safe materials, water and energy in circular economies and eliminates the concept of waste. Everything is a resource for something else. In nature, the “waste” of one system becomes food for another. Everything can be designed to be disassembled and safely returned to the soil as biological nutrients, or re-utilized as high quality materials for new products as technical nutrients without contamination. Use clean and renewable energy. Living things thrive on the energy of current solar income. Similarly, human constructs can utilize clean and renewable energy in many forms—such as solar, wind, geothermal, gravitational energy and other energy systems being developed today—thereby capitalizing on these abundant resources while supporting human and environmental health. Celebrate diversity. Around the world, geology, hydrology, photosynthesis and nutrient cycling, adapted to locale, yield an astonishing diversity of natural and cultural life. Designs that respond to the challenges and opportunities offered by each place fit elegantly and effectively into their own niches. Rather than seeking to minimize the harm we inflict, Cradle to Cradle reframes design as a positive, regenerative force—one that creates footprints to delight in, not lament. This paradigm shift reveals opportunities to improve quality, increase value and spur innovation. It inspires us to constantly seek improvement in our designs, and to share our discoveries with others. Cradle to Cradle has been translated into 13 languages thus far. Ordering information for 11 of those languages is below. The book was published in 2002, before MBDC did assessment and certification, so the polymer has not been assessed in that comprehensive way. Melcher Media is the best source for information. They arranged the publication of the book in the polymer material (in China). We are also aware that a company called Reproduct / C2C Holdings has something similar.